At Finalé, our focus is on YOU the client. Our full-service medi-spa clinic helps YOU rediscover confidence and put their best faces forward with complete hair removal and skin rejuvenation. We are here to help you through your journey from start to finish. It’s the experience and personal touch of Finalé technicians that sets us above the rest. If you have questions, we have answers! Your experience at Finalé always starts with education. It gives you the freedom and ability to pursue your own skin care path. We have the tools and treatments to get results, whether you hope to remove excess hair or reduce the evidence of sun damage, fine lines, wrinkles, and acne scarring. Stopping the hands of time is impossible, but we can help you slow them down and even turn them back with photo rejuvenation, profractional therapy and skin resurfacing. We have fun while doing it, too! You’ll learn different ways to keep your skin looking young and fresh. Aren't all Certified Laser Technicians the same? Well, not exactly...Minnesota has minimal certification requirement and oversite. What this means for you is, at other vendors, your laser tech may have had only a few hours of training on how to set the dials. As a result, you may have mediocre results with your treatments. Arizona was the first state to establish certification requirements. Barbara became Certified in Arizona that has some of the most intense requirements in the country. She has over 10 years of experience in hair removal and has a deep understanding of the equipment. She has over 30 years of experience in a combination of hair, skin, and nails. Experience is what we provide to get you the results you want and deserve. However, what's most important to us is the experience and personal touch of Finalé Techs that sets us above the rest. We’re here to help you! Contact us for a free consultation. Below are a couple of awards we have been awarded from our community. To win these awards, you don't submit an application, the committee interviews the community then determines who is the best. We feel humbled and appreciate the recognition, but above all, we love what we do and how it helps people. 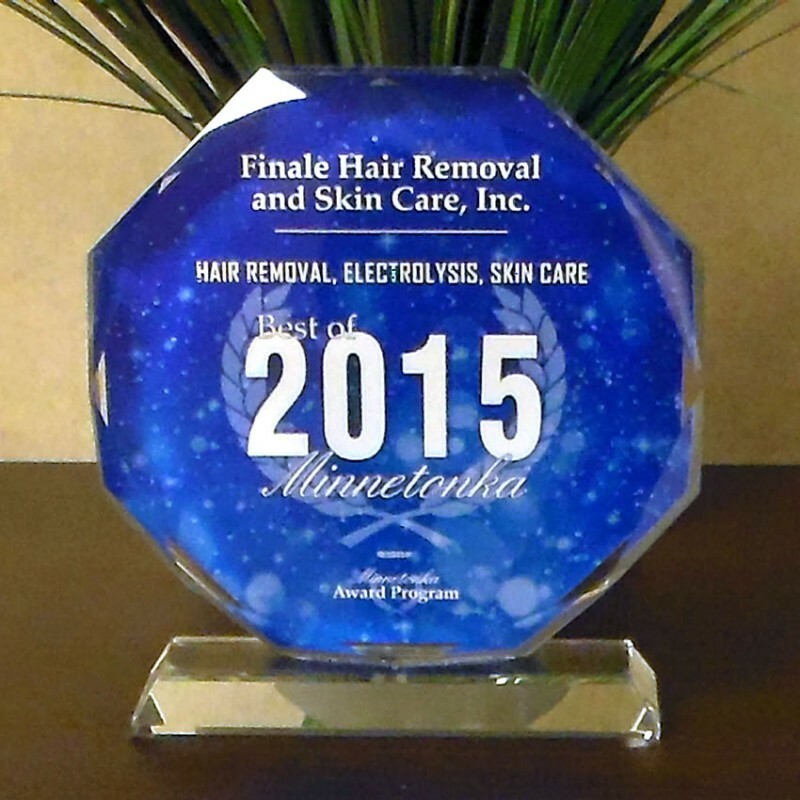 Finalé has been a part of the Best of Minnetonka for 2014, 2015, and 2016. There is a reason why our customers rave about our service. 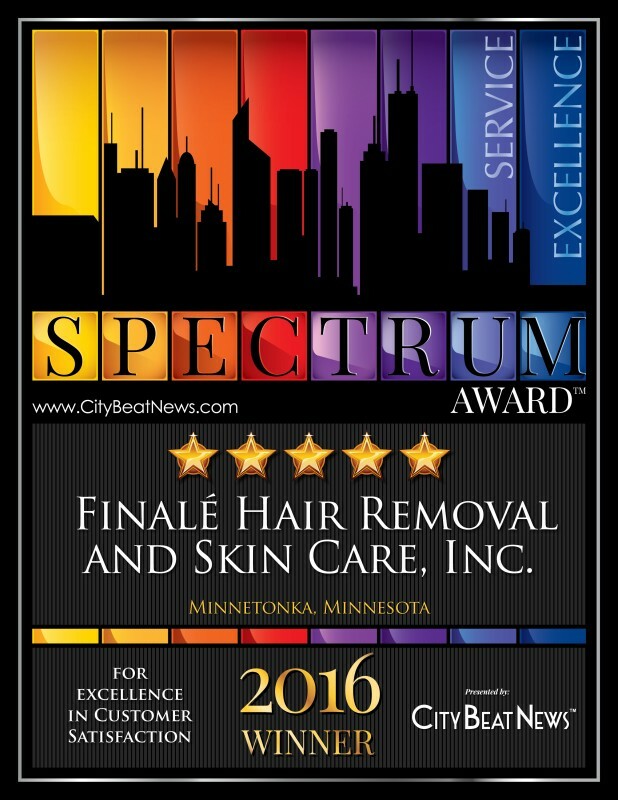 This is our first year winning the Spectrum Award from CityBeatsNews.com. Because we believe in giving back to the community, we support industry associations as one way to give back. Participation strengthens the industry but also ensures proper standards are applied so clients trust the quality of their treatments. The ASCP is a leader in the world of aesthetics. They provide community-building efforts, training for professionals, and consistent legislative advocacy that will help estheticians everywhere find success together. The DSA is the leading trade Association supporting Spa, Salon, Resort, Luxury, Esthetics, Skin care, Medical Spa, Cosmetology, Massage and more. With over 28 years of experience in providing the highest-quality, innovative cosmetic surgery available in the Minneapolis / St. Paul, Minnesota area and beyond. Thousands of patients seeking not only skill and experience, but also artistry and a caring personal touch in their plastic surgeon have placed their trust and well-being in his skilled hands.